Google keeps updating and upgrading its algorithm in order to provide the best results to its customers when they search. 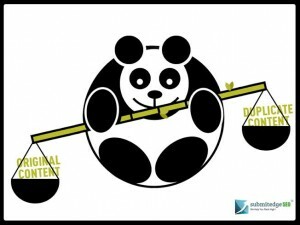 Google Panda 4.0, the recently rolled out update to its earlier algorithm filters duplicate and badly written content and penalizes the sites that are guilty of it. It is a means to find poor content and weed it out so that readers are left with just excellent, informative content of value to them. Sites with good quality content will occupy a higher ranking while those with duplicate or poor content will be pushed to the bottom. Changes in post-panda phase: Content has and will always be the backbone of SEO. Fresh and quality content has always been favored. SEO writers should pay attention and incorporate the keywords in sensible and grammatically correct sentences and make it a point to not over stuff the content with keywords. The title tags should be appropriate and descriptive. Review of the site by its readers, and recognition of the site on the social media front is equally important. What next? Guidance on how to restructure the site and build high-quality sites to adhere to the panda algorithm is given by Google itself. Sites need to remember that they are catering to living, breathing human beings and so content should be written for them and not for search engine machines. The motive should not be to merely fill up pages with mediocre content; it needs to be useful, informative and providing value to the readers. Try and answer the queries of readers through your content. Well-researched and articulated articles providing original and unique content will be accepted well by readers who will definitely want to share it with their friends and associates. * Include well-crafted sitemaps so that search engines can find the important pages easily. * Ensure that the relevant and important pages are indexed properly and do not neglect optimizing those pages. * Delete any duplicate and irrelevant URLs. * Through social media try and build up links with high-quality sites.